The time is right upon all Muslims around the world to take part in the ritual of Ramadan. Its a very special time in where one can really reflect each's own personal situation, and being thankful for the things that we may take for granted (whether it be having good health, being within a loving family and great friends, just living an overall comfortable and content life etc.). All that we are happy for is a gift from Allah, The God; and to Him does the gratitude of carrying Ramadan go to. Please check out the below post entitled Five Pillars Of Islam: Sawm for more in-depth info regarding Ramadan and its meaning. 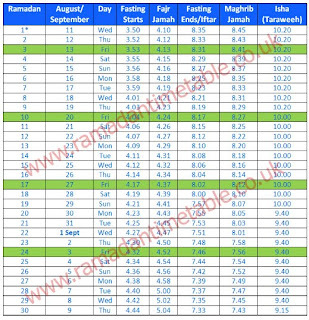 Below is an example timetable of when to perform Ramadan, but it differs depending on your location - this is due to the timing of the moon's emergence/retreat every night and day. 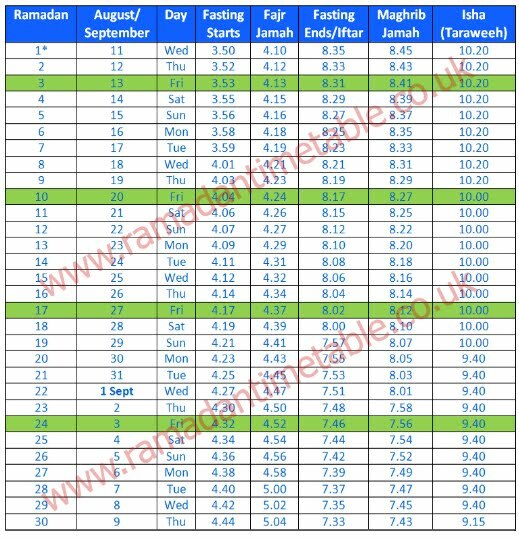 The timetable below is for those within the London area - for other areas in the UK please visit http://www.ramadantimetable.co.uk/ramadantimetable-uk.